Unique Moments Photography of Gig Harbor Washington provides total event coverage and we do not book by the hour. 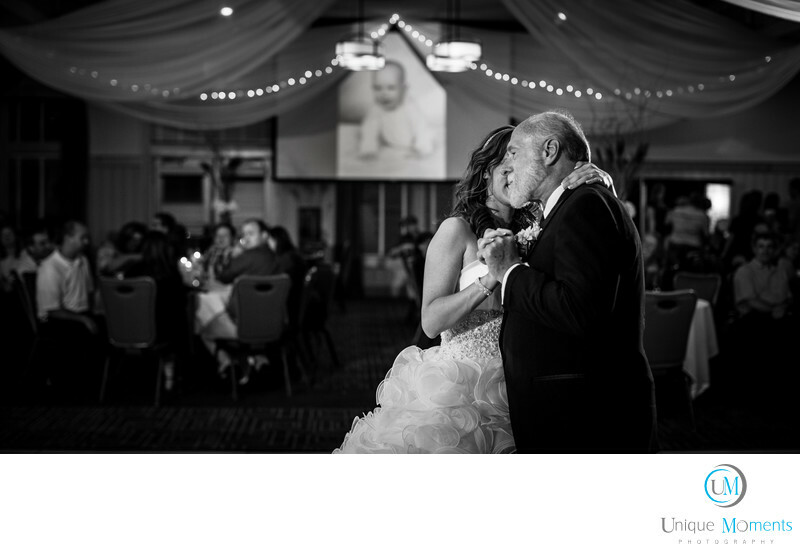 This images speaks volumes as to why we stay and capture the big moments at your reception. Please read this very slowly and very carefully. The most memorable pictures from your wedding will be from the getting ready Pictures and the pictures at the reception. End of story. And, The Father Daughter dance will probably result in the most impact emotional images of the day. After photographing weddings for 9 yrs we have definitely found this to be true for the majority of weddings we have covered. If your photographer is hesitant to cover your reception, hire another photographer. Human emotion is clearly evident in this image and it remains one of our favorites ever captured. This picture on the big screen is the bride when she was a baby. The bride already lost it and was crying tears of happiness on her fathers shoulder. And dad was trying to be the rock and hold it all together. The image was captured with 2 off camera flash lights. Images like this cant be made if you don't have a professional photographer at your reception. We are there from start to finish because we have to tell the entire story. Reception images are must haves for your wedding pictures. There is so Much that happens at receptions. Dont short yourself or be short sighted. Have your photographer capture the import things that happen at wedding receptions.